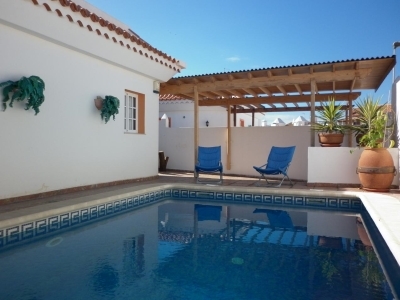 Villa Sherry is three bedroom three bathroom villa in the unspoilt village of La Caleta in Costa Adeje Tenerife. It is in an excellent location being just 50 metres from the sea front and only a 10 minute walk to the nearest beach, Playa del Duque. The villa as several outside spaces including a garden with a barbeque, patio table and chairs where guests can enjoy alfresco dining. The private pool and sun terrace is furnished with sun loungers. There is also a pergola by the pool which provides a little shade. Finally the roof terrace has more sun loungers and a sun parasol. The villa has amazing sea views from the roof terrace. There is one double bedroom wand two twin rooms, all of which have ensuite bathrooms. The lounge is spacious and modern with sofas and satellite TV including English channels. The kitchen is well equipped and includes a fridge/freezer, oven, hob, extractor fan, washing machine, microwave etc.